You have found the missing pieces to your Nesting or Stacking Doll Collection! Here is a Matryoshka Doll from Russia. It features a Young Lady with a Beautiful Pink Flowered & Black Dress with Silver & Gold Accents. There are 15 Dolls in the Set, and it is Signed by the Artist & dated 1996. The first doll is 6 1/4 tall, and in excellent preowned condition. See our Store for more Collectibles & Dolls. We will normally get back to you within 24 hours. Thanks for looking at our Store! 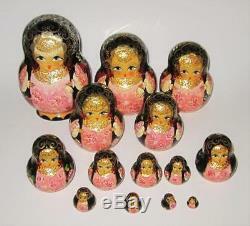 Russian Nesting Doll Stacking Doll Matryoshka 1996, Sign Ceprueg Necag 15 Pieces. The first doll is 6 1/4 tall, and in e xcellent preowned condition. We find them at Central Florida antique shows, auctions and estate sales. Antique or vintage items may, by nature have flaws and imperfections due to age. While we are not experts on this merchandise, we do our best to describe them as accurately as possible through pictures and descriptions. We do this as a hobby and strive to make our customers happy. Get Supersized Images & Free Image Hosting. Create your brand with Auctiva's. Attention Sellers - Get Templates Image Hosting, Scheduling at Auctiva. The item "Russian Nesting Doll Stacking Doll Matryoshka 1996, Sign Ceprueg Necag 15 Pieces" is in sale since Thursday, February 15, 2018. This item is in the category "Dolls & Bears\Dolls\By Type\Nesting". The seller is "claireted" and is located in Orlando, Florida. This item can be shipped to United States, Canada, United Kingdom, China, Mexico, Germany, Japan, France, Australia, Russian federation, Denmark, Romania, Slovakia, Bulgaria, Czech republic, Finland, Hungary, Latvia, Lithuania, Malta, Estonia, Greece, Portugal, Cyprus, Slovenia, Sweden, South Korea, Indonesia, Taiwan, Thailand, Belgium, Hong Kong, Ireland, Netherlands, Poland, Spain, Italy, Austria, Israel, New Zealand, Philippines, Singapore, Switzerland, Norway, Saudi arabia, Ukraine, United arab emirates, Qatar, Kuwait, Bahrain, Croatia, Malaysia, Chile, Colombia, Costa rica, Dominican republic, Panama, Trinidad and tobago, Guatemala, El salvador, Honduras, Jamaica, Antigua and barbuda, Aruba, Belize, Dominica, Grenada, Saint kitts and nevis, Saint lucia, Montserrat, Turks and caicos islands, Barbados, Bangladesh, Bermuda, Brunei darussalam, Bolivia, Ecuador, Egypt, French guiana, Guernsey, Gibraltar, Guadeloupe, Iceland, Jersey, Jordan, Cambodia, Cayman islands, Liechtenstein, Sri lanka, Luxembourg, Monaco, Macao, Martinique, Maldives, Nicaragua, Oman, Pakistan, Paraguay, Reunion.